Youconvertit is a new online file conversion service that allows you upload audio, video, image, or document files and convert from one format to another. It is a very useful tool that makes you much easier than before. 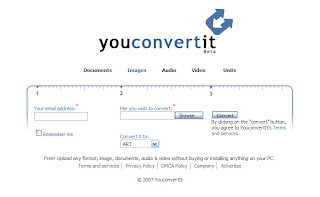 It is not like other convert sites that only convert media files or documents, Youconvertit puts them together, even you can check different units. It is a free service, you do not register, only offer your email address that inform you the file converted and a link for download.